Hello girls to our game portal a game has arrived so you can paint the adorable girls of enchantimals. We will live with them and their best friends a fun moment coloring the images of these girls in their world where everything is fun and adventure. This fun game can be made from any device: Smartphone, Tablet and PC. Click on this exciting game where you will color the images of these beautiful girls. 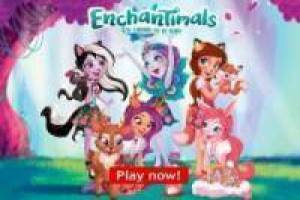 Enjoy the game Color the Enchantimals, it's free, it's one of our girls games we've selected.